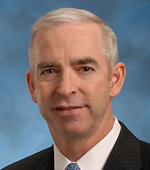 Gary McAlum is USAA’s Chief Security Officer. His responsibilities include: Information Security & Privacy, Fraud and Financial Crimes Management & Investigations, Business Continuation Planning, Corporate Investigations, and Physical Security services. Prior to joining the USAA team in February 2010, he completed 25 years of service in the US Air Force and spent a short time with Deloitte & Touche, LLP in Washington DC. Gary entered the Air Force career in 1983 as a Distinguished Graduate of the Air Force ROTC program at The Citadel, Charleston, SC. Throughout his career, he worked in a variety of staff and leadership positions within the information technology career field including: telecommunications, deployable and satellite communications, network operations, and information security. . Gary was also on the front line of cyberspace operations for the Department of Defense. He was a major figure in the establishment and evolution of the Joint Task Force Global Network Operations, the U.S. Strategic Command organization that is the focal point for the operation and security of DoD information systems and networks. During this time, he was frequently called upon to provide cyber threat insights to a wide variety of interagency forums, including the U.S.-China Economic and Security Review Commission, the President’s National Cyber Study Group, and Congressional testimony. In addition, he worked extensively with the intelligence community to improve information sharing processes and operationalize new technologies. After retiring from the Air Force in September 2008, Gary joined Deloitte’s federal practice working in the area of Security & Privacy Services. While there, he co-authored Deloitte’s global perspective entitled, “Cybersecurity: Everybody’s Imperative; Protecting our economies, governments, and citizens.” Also, he served on a Presidential cybersecurity task force that developed recommendations for a joint public-private sector operational capability to respond to cyber events of national consequence. Gary holds a Bachelors Degree in Mathematics from The Citadel and a Masters Degree in Management Information Systems from the University of Arizona. Additionally, he is a distinguished graduate of both the Air Command & Staff College as well as the Industrial College of the Armed Forces, where he earned a Masters Degree in National Resource Strategy. He is a Certified Information Systems Security Professional (CISSP), a Certified Fraud Examiner (CFE), and has completed the Wharton Security Executive Development Program. In addition he attended the FBI CISO Academy.